In recent years, Safety and Hearing has seen a rapid increase in awareness in the workplace. When it’s their hearing safety on the line, they’re absolutely right! That’s why our Custom Fit Hearing Protection is the right fit for you. Our Custom Fit Hearing Protection provides maximum protection against harmful noises, exceeding WCB standards. They are custom crafted for each individual from the most comfortable sound reducing materials available. Whether or not you use hearing protection regularly, it’s never too late to protect your hearing with Custom Fit Hearing Protection. You’ll Hear the Difference! At Combined Workplace Safety Consulting, our qualified technicians are here to assist you with the everyday safety challenges in your workplace including making it easier for your staff to wear their hearing protection. With preferred choice colors for you to chose from, safety has never been easier to use! 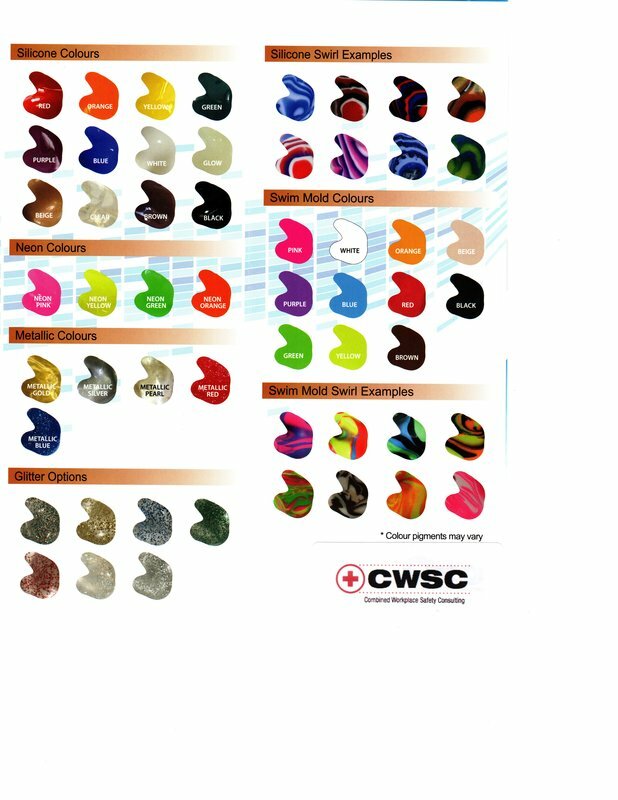 Cool, sleek styles of Custom Fit Hearing Protection. ​Custom made ear plugs will provide the best hearing protection. Many people don’t realize that occasional and intermittent noise in the workplace increases the rate of natural hearing loss. In conditions where noise is persistent or excessive, such as in construction and industrial environments, those who fail to properly protect their ears run a much higher risk of irreversible hearing loss. What would you do if you couldn’t hear? Many people don’t realize that occasional and intermittent noise in the workplace increases the rate of natural hearing degradation. In conditions where noise is persistent or excessive, such as those in construction and industrial environments, those who fail to properly protect their ears run a much higher risk of irreversible hearing damage. Custom Fit Hearing Protection provide ultimate protection to those in noise impacted environments. Available in all colour, glitter and swirl options. Call or email today to place your order!